Admittedly, this action set-piece is splendid. One thing The Flash is getting right is making sure there are one or two really memorable visual set pieces per episode. Another thing the episode has going for it is the arrival of General Eiling, played with relish by Clancy Brown. The man manages to growl lines like, “You heard him Joe – give me what I want,” sound like the most dangerous threats ever uttered without needing to raise his voice. He looks set to be a great recurring character. When Joe muses, “So, human bomb. Must be Tuesday in Central City,” that’s an in-joke referring to the fact that The Flash airs on Tuesdays in the States (and the UK, but that’s a coincidence). 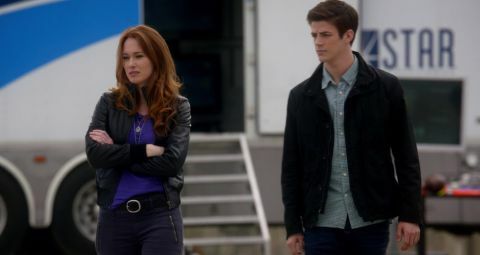 Other than these and the show’s other usual dependable elements (the fun, easy-going relationship between Barry, Cisco and Caitlin; Wells showing the shadowy side of his character; a final scene that raises the hairs on your neck as the plot thickens), the episode is a little humdrum. Bette only ever feels like a half-developed character adding to the lack of emotional clout to her death. Barry’s rooftop chat with Iris has an almost complete lack of spark or frisson. Barry’s (lack of) drinking problems is a forgettable and underdeveloped running gag. If “Plastique” is the blueprint for what makes an “average” episode of The Flash, then things could be a whole lot worse. It’s entertaining fluff and only really disappointing because the show’s been so good so far. Guest star Clancy Brown, who plays General Eiling, was the Kurgan in the original Highlander and Captain Hadley* in The Shawshank Redemption, but he also has DC credentials: he’s been the voice of Lex Luthor in various animated Superman cartoons, the voice of Parallax in the Green Lantern movie and the voice of Zartok in Green Lantern: The Animated Series. *Incidentally, there’s a character called Dr Harold Hadley in this episode. Plastique was introduced into the DC Comics universe as an enemy for Firestorm in Firestorm Volume Two #7 (1982). In the DC Comics universe Eiling was the dodgy officer who helped turn Nathaniel Adam into Captain Adam, and then blackmailed him into working for the military (when he was given the alias Cameron Scott – the name given as Plastique’s “emergency contact” in this episode of The Flash). He was first introduced in Captain Atom #1 in a run that also featured Plastique. Alcohol cannot be 500 proof (which is what Caitlin claims the drink she concocts for Barry is). Pure alcohol is 200 proof. Presumably Dr Wells “calculates” that Barry needs to reach a speed of “approximately 650mph” to run on water so quickly, because he knows the figure already. Just that trusty old war horse Channel 52 this week (it’s cropped up in Arrow too, and is based on the fictional news channel in DC comics that “reported” on New 52 events). Just a reminder, really: we saw the super-ape Grodd’s cell in the pilot episode, but empty. Presumably he escaped in the wake of the STAR labs explosion, though it’s just as likely Wells released him. Barry discovers three new powers this week: the ability to run up walls; the ability to run on water; and the ability to know exactly where to stand to be beautifully backlit. Barry has to deal with a metahuman whose touch turns objects into bombs.